Series in Cognition and Perception: Depth Perception Through Motion focuses on the processes, methodologies, and techniques involved in depth perception through motion, including optic array, rigid motions, illusions, and axis. 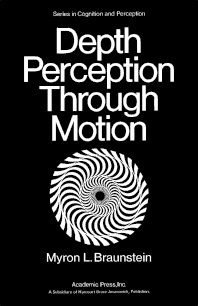 The book first elaborates on the paradox of depth perception, illusions of motion in depth, and optic array. Discussions focus on rigid motions in three-dimensional space, perspective gradients, projection plane, stereokinetic effect, rotating trapezoid, and the windmill and fan illusions. The text then examines transformations leading to the perception of depth, slant perception, and perceived direction of rotary motion. Topics include shadow and computer projections, direct observation of rotating figures, a model of the perception of rotary motion, dynamic slant and static slant perception, translations along the Z axis, and rotations about the X or Y axis. The publication is intended for researchers and graduate students interested in depth perception in dynamic environments.